Whether you*re staying in Miami for just a few nights or for much longer you*ll discover your home away from home at the new Homewood Suites by Hilton Miami Dolphin Mall. We are located adjacent to the Dolphin Mall and less than one mile from the Miami International Mall Miami*s premier retail destination. We are also within 4 miles of Doral and world class golf and only 10 miles from Miami International Airport. The shopping dining attractions and entertainment of downtown are just 16.3 miles from our all-suite Miami hotel. Savor a free full hot breakfast every morning and unwind at the complimentary evening social* Monday Thursday. 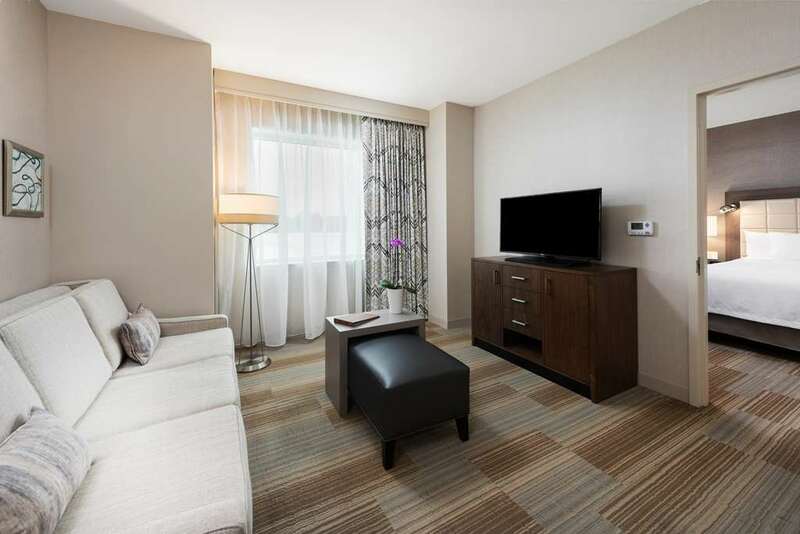 Settle into a stylish suite offering everything you need to feel at home including complimentary WiFi access a work desk an HDTV plush bedding and a full kitchen. Make the most of your leisure time at this extended-stay Miami hotel. Work out with the latest wellness technology in the expanded fitness center swim in the sparkling outdoor pool or top up your tan on the sun deck. Enjoy a farm to table selection of entrees and appetizers at The Flamingo Grille which serves American classics influenced and inspired by the vibrant local flavors popular in Miami. With a 24-hour business center and 5 500 square feet of conference space available in the attached Garden Inn our hotel is an ideal base for meetings training events and celebrations for up to 175 people. * Subject to state and local laws. Must be of legal drinking age. Reservations must be cancelled 48 hours prior to local time to avoid penalty. Policy is subject to change.